If you are on the internet, you are likely to have a social media account as well! That is how spectacular the rise has been with regard to the use of social networking platforms by users around the globe. Whether it is individuals, professionals or businesses, most have a significant presence on social media sites. In fact, you are likely to come across a similar set of individuals and businesses on more than one social networking websites, including Facebook, Twitter, Instagram, LinkedIn and Google+. And, therein lies the difficult part! Most people or businesses create their profiles or pages on multiple social networks, but fail to manage the posts, updates or even analytics. This fuels the need to have efficient social media management (SMM) tools that make it easy for you to handle one or more social media profiles. In this age of the mobile revolution, most people access social media on the go and, hence, these popular tools empower you to achieve the same by scheduling your posts and managing them from a single dashboard (in most cases). Importantly, these tools also assist you in achieving more traffic to get more likes or followers. And, for businesses, it triggers a good number of leads that have the potential to convert into sales or customers. So, what are the top Social media marketing tools? Let us take a look at some of these tools by considering their features as well as advantages and disadvantages. The objective is to understand which ones fulfil your Social media marketing requirements in the best possible way. Sendible is an up and coming SMM (Social media marketing ) tool suite with an excellent user interface. It’s is a fully integrated social media productivity tool and in my opinion, one of the best on the market. With Sendible you get 20 integrations with the top social media networks, blogs, social sharing sites. You can even hook it up to Slack, which makes communicating with other members of your content marketing team an absolute breeze. Sendible is a great weapon in the arsenal of a social media marketer / content marketer, as it helps you create content that get’s you and your client the traction you need as well as helping you keep your editorial calendar busy and active. This all-in-one tool helps you stay on top of the important stuff that appears on your social media profiles through its social inbox. You can track all your name or brand mentions and even immediately respond to any negative comments (from customers or readers) to establish a solid rapport and open a communication channel. It also provides marketing automation tools and social CRM to drive leads and target prospects for your business. Moreover, you can get beautiful and well-detailed analytics reports that show how well your audience has been engaged with your social sites. Sendible has some awesome automation tools such as automatic replies set ups to tweets or DM’s, retweets and welcome messages. They’ve also developed an Instagram automation tool, which I must say is so much better than Hootsuite’s Instagram tool. It will automatically set out to search for posts with a specific hashtag and likes them. You can also set it to automatically follow the profile of the post and unfollow them if they don’t follow you back in 24 hours! Integration with all major social media sites like Facebook, Twitter, LinkedIn, Instagram, Google+, Pinterest as well as blogging platforms like Medium, WordPress and Blogger.com. Easy to manage multiple social profiles. RSS Feed poster, content suggestions, in-built content library and easy access to the design tool, Canva. Ideal for social media manager / social media exec. Geographic keyword monitoring isn’t spot on in terms of accuracy, so take with a pinch of salt. Toyota, The Irish Times, Sony Music, Zynga, BBC Worldwide and so on. Social Booster is another highly comprehensive SMM solution that makes SMM really easy. It automates the process of posting updates by scheduling them in advance (you can even schedule them weeks and months prior to the day that you want the posts to be published) and keeping your social media presence active, even while you are offline. It also gives you access to a single dashboard that you can use to manage your multiple social media accounts and remain engaged with your audience at all times. Moreover, you can get a complete insight into the performance of your social media activities and campaigns, which helps you develop a sound understanding of your audience. And, you can get these reports on demand. For businesses, Social Booster also enables you to create a workflow from the dashboard for your team members, which will increase your overall business productivity. It also helps your business increase its reach through increased usage of social media, without spending additional time for the same. It offers a free account, with no credit card information required to sign up for the same. When you sign up for this free account, you can select one of two categories: Business & Personal or Social Media Agency (for agencies or companies that handle the social media accounts of multiple clients). The four different plans offered are Personal, Toolbox, Pro and Enterprise, with prices starting at £7.16 per month (annual subscription) or £8.95 per month (monthly subscription). It supports Facebook, Twitter, Instagram, LinkedIn, YouTube and more. It is suitable for businesses of any size (small to large). It offers 500 Twitter followers for free. It provides 24×7 customer support for all your queries and issues. You get the ability to run ad campaigns for your social media accounts right from the Social Booster dashboard. There is no support for Google+. No details about the pricing of the paid plans are shared on the official Social Booster website. You only get to check the pricing after you have logged in or signed up with your free account. This is a smart SMM tool that helps you achieve consistent scheduling of your posts to your different social media accounts. You can quickly add articles, videos, photos and other content to the queue, even while you are on the move, and then stagger the posting times, as per your convenience. This is possible by using the different Buffer mobile apps and browser extensions. You can also get valuable insight and analytics about the traffic drawn to your social media content with the Buffer app. For individuals, it offers a free plan and the Awesome plan (starting at $10.00). For businesses, it offers small, medium and large plans, with prices starting at $99.00 and reaching $399.00. It also offers an enterprise plan, starting at $899.00 per month. It supports Facebook, LinkedIn, Twitter, Google+, Pinterest and more. It provides a virtual queue to push through the content via staggered posting times throughout the day. In other words, you can schedule content across all the social media sites, without having to individually schedule them. It gives you the ability to create your own content (images), using Pablo for social media sites. It does not support Instagram. This is one of the most popular SMM tools to schedule campaigns across various social networking platforms as well as measure or track the campaign results via its simple web-based dashboard. It allows you to schedule messages and tweets, track conversations, manage unlimited social media profiles, view Google Analytics and even offers Facebook insights integration. Hootsuite displays all your social media accounts in multiple streams and provides good team collaboration features that can boost the overall productivity of your business. It also gives you access to about six social media marketing online courses, along with the option to get certified in SMM. Read more in my Hootsuite Review. 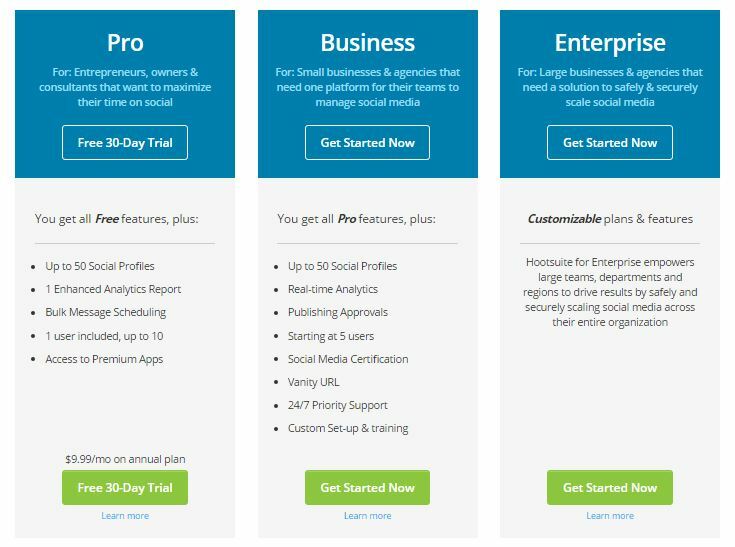 You can avail Hootsuite’s free plan, Hootsuite Pro plan (with a 30-days free trial and the pricing starting at around $9.00 per month) or even the enterprise plan. It supports Facebook, Twitter, LinkedIn, Google+, Instagram, YouTube and more. This web-based tool does not need any software to be installed on your system. It gives you the ability to manage multiple social media profiles from a single dashboard, without having to log in to each of those sites separately. It extends support for the management of multiple YouTube accounts from its dashboard, apart from enabling you to schedule different video posts to your profiles. The Hootsuite mobile apps are available for Android and iOS. You can only add three social media profiles with the free account. Only a limited number of URL shorteners (owl.li, ow.ly, htl.li and ht.ly) work with Hootsuite, for adding links to messages. DAVIDsTEA, Marketo, NYC, The Herschel and so on. If This Then That (IFTTT) helps you establish or create connections for a variety of social media sites, services and channels. A staggering 306 channels’ connections can be created with IFTTT. Moreover, it improves your productivity based on an action-reaction mechanism. For example, you can get a Facebook post or a tweet updated automatically once you submit a new blog post. 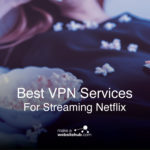 So, you can choose to connect your preferred network with the action of your choice via IFTTT. This trigger-action setup for your profiles is termed “recipe” with regard to IFTTT. Not applicable, as it is a free tool. It automates sharing on social media apps and sites, such as Facebook, Twitter, Pinterest, YouTube and Instagram. IFTTT may not always suffice all your SMM needs and is generally used along with other powerful tools, such as Hootsuite or Social Booster. This is another highly effective SMM tool that possesses a seamless publishing system for posting your messages and tweets on social media sites. You can also get detailed analytics reports to keep track of the results from the activities. Apart from the social content, you can also track the monitored keyword searches with Sprout Social. It offers three different types of plans (Deluxe, Premium and Team), with the lowest starting at $99 per user per month. It supports Twitter, LinkedIn, Google+ and Facebook. It possesses social customer relationship management (CRM) tools, consisting of shared customer records, advanced scheduling tools (like ViralPost), team collaboration tools (including live activity updates) and more. You get a 30-days free trial with all of its plans. It lacks support for major social media sites like Pinterest. UPS, Hyatt, PepsiCo, Stanford University and so on. This tool offers you updates about your social content, using the social media inbox (an email-like inbox). It retains old conversations as well as syncs all your social media profiles in real time to ensure that you do not miss any comments, likes, tweets and so on. Also, you can avail customised reports, which is presented in PowerPoint with amazing graphics, to measure your efforts. It offers four different plans (Micro, Small, Medium and Large), with prices starting at $15.00 per month. It supports Facebook, Twitter, Instagram and more. It helps you achieve more with CRM software. You get the ability to arrange custom contests and promotions for better social media engagement. It lacks support for Google+, YouTube, Pinterest and so on. 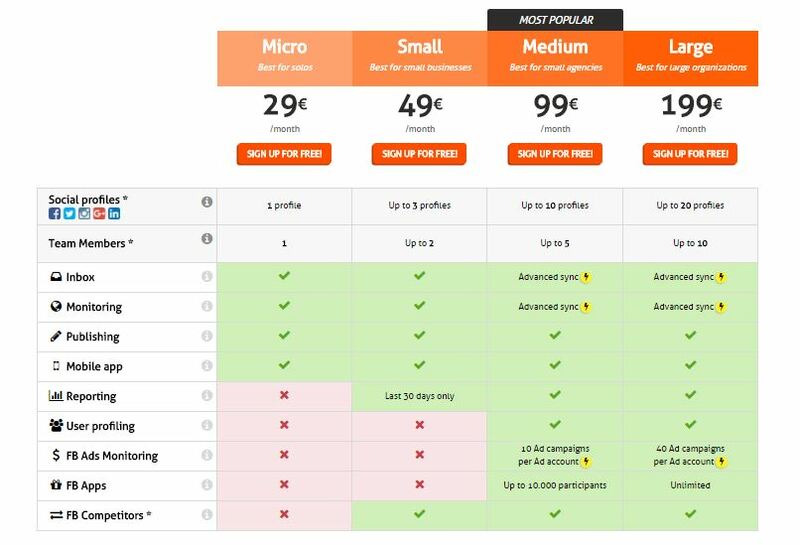 The Micro plan only supports one social media profile, which proves expensive. Yahoo, PepsiCo, McDonald’s, Nivea and more. PostPlanner not only helps you schedule posts, but also helps you get increased engagement from your readers or followers on the social media platforms. It focuses more on helping you find the right content and getting it published (via a queue or scheduling) to increase the traffic to your profiles. It has this unique “viral content” functionality that shows you the most viral images, videos, articles, news and more from your industry. You can then use such viral content to enhance the engagement on your sites. 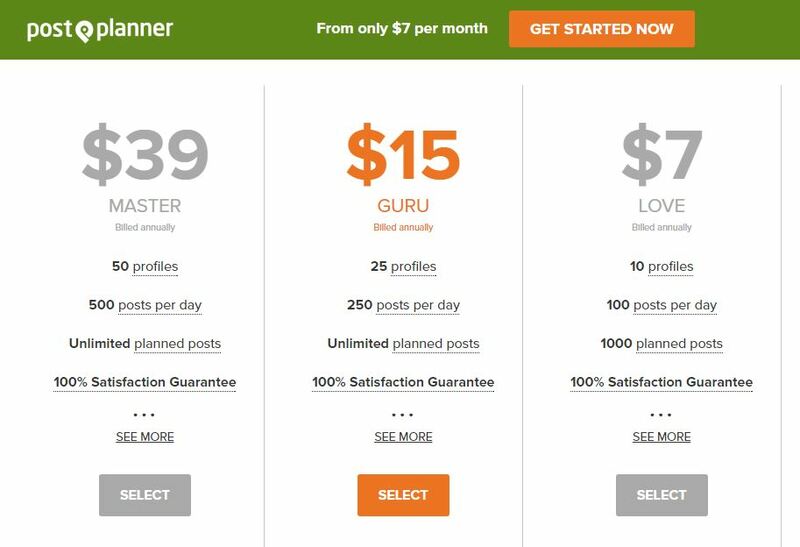 It offers three different plans (Love, Guru and Master), with prices starting at around $7.00 per month. It supports Facebook, Pinterest and Twitter. Low prices, starting from as low as $7.00 per month, are offered. It helps you find viral content and use the same for increased engagement and traffic. It lacks support for Instagram, Google+ and so on. This is another social media monitoring, social media listening and analytics tool that helps businesses make informed decisions based on thorough and scientific analysis of data. You can track all your social conversations and it offers a keyword search feature, which allows you to keep track of what people are saying about your brand, business and competitors. You can even get analyses about your competition and gauge where you stand in comparison. It offers four different plans (Free, Starter, Value and Enterprise), with prices starting at around $49.00 per month. It extends support for Twitter, Facebook, Linked, Instagram and YouTube as well as news sites, blogs and online forums. Social Clout helps you monitor your brand mention on social networks in real time. SocialOomph was initially known as TweetLater.com, as it primarily focused on increasing productivity solutions for Twitter users. Later, it also started paying attention to overall productivity enhancement services (free and paid) for several other social media platforms as well. 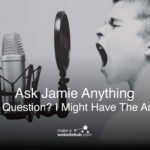 For most sites, it offers the basic handling of unlimited accounts (with the paid plan) as well as scheduling posts and updates to their pages or walls. With regard to Twitter, it offers some special features, including keyword searches, following those who followed you, Digital Marketing (DM) Inbox clean up, tracking mentions and retweets and tweet via email. 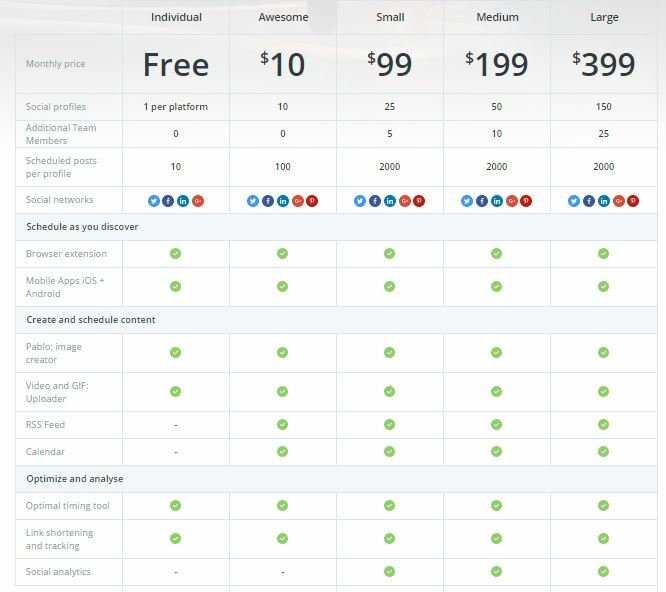 It offers several services for free, while others are premium services. With the SocialOomph Professional account, you do not need any long-term contracts and can make payments (starting at around $17.97) every two weeks (after the initial seven-days free trial period). 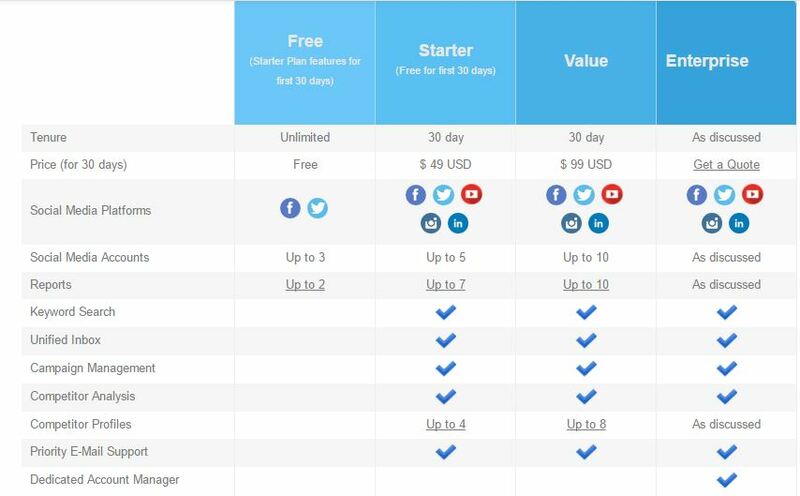 You can also upgrade from the free plan to the SocialOomph Twitter Unlimited plan for $6.97 (payments to be made every two weeks). It supports Facebook, Twitter, LinkedIn, Pinterest and so on. It also supports Tumblr, RSS feeds, Plurk and App.net. It does not offer advanced SMM features for platforms other than Twitter. This SMM tool ensures that you get maximum benefits from every single social media update you make. In other words, even if you post an update when few people will be engaged, Edgar will still keep posting the same update automatically when you post another update for that category. It thus ensures that none of your updates or posts go unnoticed. To achieve this functionality, Edgar maintains an online library where all your updates are stored as per the different categories, such as motivational quotes, news, blog links and images. You can start using Edgar by paying $49.00 per month. If you do not like its features, you can get your money back by cancelling your Edgar account within the first 30 days. It recycles categorised social media updates and reposts them repeatedly to get more likes, followers, and so on. It supports Twitter, Facebook and LinkedIn. 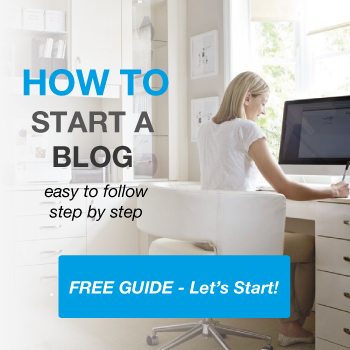 Edgar is ideal for freelancers, bloggers and businesses. 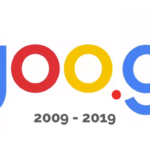 It lacks support for Pinterest, Google+, Instagram and more. This comprehensive platform enables you to get results for your social media activities from a single dashboard. You can carry out scheduled postings on a daily basis, establish goal-based campaigns (such as events, promotions and product giveaways) and analyse the campaign data. It is best known for its ability to allow you to focus on campaign-based posting, where you can submit posts individually or in a series. You can enjoy a free trial period of 14 days, before starting to use any of their three plans (Silver, Gold and Enterprise), with prices starting at around $28.00 per month per user. It supports Facebook, Google+, Twitter, LinkedIn and more. 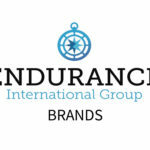 The Greenside Agency, Karma Inc. Apparel, Visit Detroit, Frends Beauty and so on. This is a smart SMM tool that uses predictive analytics to determine what the right time is to post your content. The ideal time to publish the content is determined by its software which uses real-time data, once you put your content in the queue. In addition, it ensures that your updates reach the largest possible audience by posting the content when they will be most active and more engaged. No pricing details or plan details are shared on SocialFlow’s official website. It offers the Video Vault Uploader for Facebook that supports the uploading of big video collections (up to a thousand video segments) on Facebook. It supports Facebook, Pinterest, LinkedIn, Twitter and Google+. A social media advertising platform is offered for marketers and agencies to reach out to a larger audience on Facebook and Twitter. It lacks transparency about the pricing and plans, as no information is shared on the website. Nickelodeon, BBC, L’Oréal and Walmart as well as publishers, such as Mashable, The Economist, National Geographic and The Washington Post. While managing the different social media platforms for your website or blog, your aim should always be to get more traffic. And, an effective way to determine how quickly your site’s content is getting spread is to track the shares that you get for your social media posts. SocialCount is a free tool that enables you to do just that; it gets the number of shares for your main site URL or even any other articles or news on your site. It also offers a detailed number of shares for every page on your site or blog. Both freelance and professional blogger can easily use this tool by entering their site’s URL and learning how many times the URL was shared across social media platforms. This is a free web-based tool that does not require any software to be downloaded. It supports Facebook, Twitter and LinkedIn. It lacks support for other popular social networking sites, including Pinterest, Google+ and Instagram. This SMM tool is dedicated to the Instagram platform. It gives you an easy and smart way to schedule posts (videos and images) and make bulk uploads for your multiple Instagram accounts via a simple web interface for your brands and business. It offers a free trial period of seven days and the prices start at $20.00 per month for one Instagram account, with a maximum of 10,000 followers. It gives you the ability to add filters or crop images, before uploading them individually or in bulk (now or at a later scheduled time). It lacks support for a free plan. We hope that the above detailed information about the features, pros and cons of some of the best SMM tools prove valuable to you. If you have used any of these tools before, please feel free to share your experiences in the comments section below. I will trial and see if it’s worth adding to this list. I love SocialPilot! really made my life much easier with its amazing user interface and features! My favourite feature is Client Connect where you can handle your clients social media without credential exchange or being an admin. Nice list! I suggest that you take a look at eClincher. I believe they stand fairly well beside these tools.